On July 9, 2017, NATO delegation headed by His Excellency Mr. Jens Stoltenberg, Secretary General of NATO, arrived in Ukraine by aircraft, which landed at Kyiv−Antonov airport of ANTONOV Company. On July 10, before the delegation departure, presentation of ANTONOV transports: AN−132D, AN−178, AN−22 Antei, AN−124−100 Ruslan, AN−225 Mriya to the high guests was conducted. 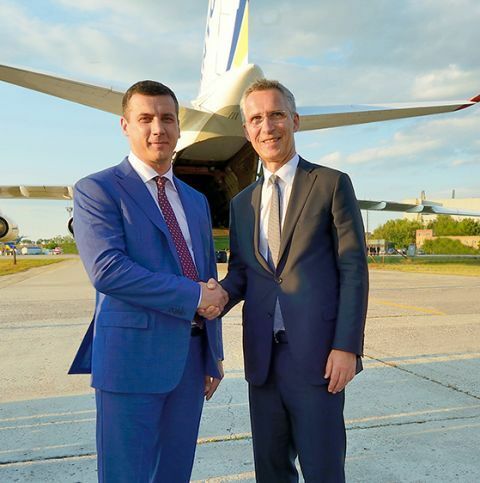 The most attention the Head of Alliance paid to airplanes of Antonov Airlines, which has been performing strategic airlift operations in the interest of NATO member states since 2006. At that, continuity in an experience of the Antonov transport aircraft creation was emphasized. The appearance of these freighters in proper time provided new abilities in the area of oversized and non−standard cargo transportation. At present, ANTONOV Company continues works to provide airworthiness of these famous airplanes and their compliance with modern requirements. Mr. Stoltenberg said: “As many people worldwide, I have heard about AN−225, the biggest transport aircraft. But today I had a possibility to be aboard and to fell tremendous dimensions of this airplane. I am impressed with the power of human idea able to create such airplane! Modernization of Ruslan and Mriya, the assumption of their series production has to become an international project involving different nations». Share the post "ANTONOV presented its modern programs to NATO delegation"